Measurements: 4 Regular + 4 Mini Coiled Stoppers. Characteristics: Dense foam disk used for the Japanese braiding art of Kumihimo. Quantity: 1 Pack of 8. 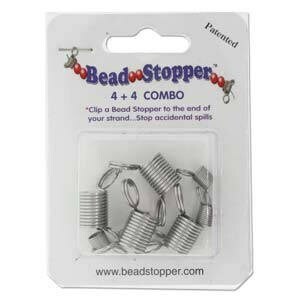 Additional Information: Bead Stoppers are used to help keep your small bead/seed bead projects together.... no more spilled projects! Just squeeze the two end loops and as the coil opens, insert your string. Will hold string securely without harming string or beads.